Such debates could undoubtedly be paralleled in many other countries, in Africa and around the world. But whether the tensions escalate to harassment or even violence depends in large part on the actions of politicians and other community leaders. Such political mobilization in South Africa, Jean Pierre Misago found in an empirical survey of incidents from 1994 to 2018, consistently provided the trigger for violence. And comments by politicians are again stirring up resentment in the lead up to national elections in May. This AfricaFocus Bulletin contains several articles on recent incidents in South Africa, including one drawing on parallel cases in West Africa from decades earlier. Another AfricaFocus Bulletin sent out today, and available on the web at http://www.africafocus.org/docs19/migr1904a.php, highlights recent data on the large proportion of African migrants who choose to move to other countries in the continent rather than more distant destinations. 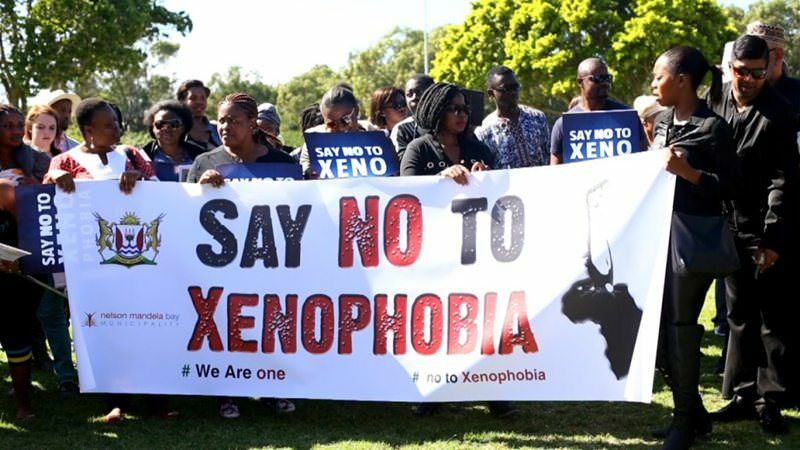 Xenophobic violence has erupted in South Africa again, in a cycle that is now being fueled by politicians ramping up anti-immigrant rhetoric in a country where foreigners are easy targets. Last week, Malawians living among South Africans in a squatter camp on the outskirts of Durban were attacked by their neighbors. More than 100 crowded into a police station for protection and were eventually housed in a tent in an open field. Unconfirmed reports said two people were killed. The latest attacks were vigilantes who were said to have found a Malawian man with stolen goods. Over several days, Malawians in the settlement were targeted as retribution. Calm was restored by Apr. 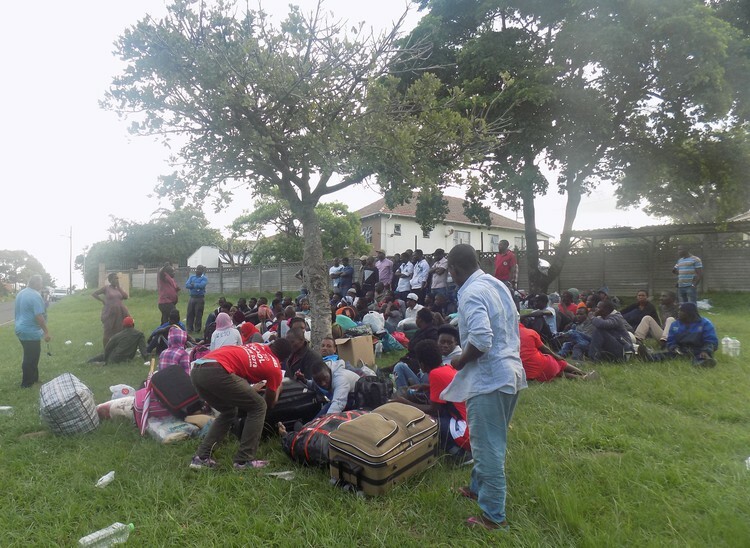 1, after South Africans officials intervened, the local Islamic Society and other NGOs negotiated and the Malawian community of Durban had to write a letter apologizing on behalf of one man, according to a statement from the mayor’s office. No arrests were made. Elias Twaibu barely survived the 2015 attacks in Durban in which several people were killed. The 30-year-old went back home to Malawi, but that country’s economic straits drove him back to South Africa, where was again attacked last week. The attacks aren’t usually targeted against one nationality, with Somalis, Congolese, Mozambicans, Nigerians and Zimbabweans all bearing the brunt throughout the last decade of anti-immigrant violence. The 2015 attacks were fueled by comments made by Zulu King Goodwill Zwelithini as he flexed his political muscles. This time, the thread may not seem as direct, but the attacks come after weeks of anti-immigrant rhetoric by South African politicians. On Monday (Apr. 1), president Cyril Ramaphosa condemned the attacks, reminding South Africans that they owe their African neighbors a debt of gratitude for their support during the struggle against apartheid. Yet, just days earlier, Ramaphosa himself scapegoated foreigners while on the campaign trail. “Everybody just arrives in our townships and rural areas and set up businesses without licenses and permits. We are going to bring this to an end,” he said at a rally. That’s the same line taken up by the official opposition, the Democratic Alliance. “Securing our borders,” has become a key part of their election manifesto, blaming the ANC for “failing” immigration policies. They’ve linked immigration to their main campaigning points, job creation and crime. “Johannesburg attracts more than 3,000 people every month and not all of those people are registered,” said DA leader Mmusi Maimane, calling for more secure borders and taxes on foreign-owned businesses. It’s worth noting that Maimane and the DA’s policy zero in on inner-city Johannesburg and Pretoria, home to many African immigrants, and not Cape Town, a DA stronghold and a favorite of expats, code for white immigrants. It’s an immigration strategy Johannesburg mayor Herman Mashaba has employed more blatantly and much longer, blaming foreigners for urban decay. When finally providing low-income housing, Mashaba ensured that they were only to be occupied by South Africans, potentially splitting up mixed families. Smaller parties who want to be noticed have adopted the same prejudice as policy. In 2008, more than 60 people were killed in attacks on foreigners, and since then this violence has never quite disappeared. Fuelled by economic insecurity, these attacks are mostly perpetrated by black South Africans target African migrants, the vulnerable attacking the most vulnerable. That this hatred is now being picked up by politicians is cynical, and terrifying. Thousands of residents of Alexandra in Johannesburg shut down the township on Wednesday morning, demanding that Mayor Herman Mashaba address them on solutions to problems with overcrowding, water and electricity. Residents started blockading streets in Alexandra with burning tyres and garbage at about 5am. Protesters marched down London road, moving towards the N3 highway, and ended up near the Marlboro Gautrain station where they expected to be addressed by Mashaba. Mashaba sent Yao-Heng Michael Sun, Mayco Member for Public Safety, to address the crowd but they would not allow him to speak. They insisted on being addressed by Mashaba. According to the 2011 census, about 180,000 people live in Alexandra. The township is close to Sandton, one of the most affluent suburbs in Johannesburg. Protesters said Alexandra was being neglected and they would not vote in the upcoming elections if the City of Johannesburg did not address the issues they faced. Resident Thabisile Ndaba, who was born in Alexandra and has lived there all her life, said the constant building of new shacks had resulted in overpopulation. “When you open your window, there’s a new shack. When you open your door, there’s a new shack…We are not against any foreigners or fighting with anyone. We just want the City to stop the building of new shacks because this situation is out of hand. Some people are even building shacks on the pavements where people have to walk.” she said. As a result of the overpopulation, Ndaba said, basic services such as water and electricity were stretched thin and the residents of Alexandra were suffering the consequences. She said the City should build more flats and houses so that people would stop erecting new shacks. But another resident, Judy Makwana, said she wanted foreign nationals to leave the country because they were “taking jobs” from South Africans. “We want our children to get work, that’s why I’m here. I’m fighting for my kids,” said Makwana. She accused the City of treating immigrants better than South Africans and said she would not vote in the forthcoming elections. She said immigrants “live in nice houses while our grannies live in one room shacks with five other people”. In what became a debate amongst a small group of residents, another resident Kabelo Tsotetsi, defended immigrants, saying they were starting their own businesses and not taking jobs from South Africans. He said people should be looking to government for answers on why it had failed its people instead of finding reasons to blame each other. Mukoni Ratshitanga is head of content at POWER 98.7. The Shagari Ordinance came against the backdrop of a cocktail of socio-economic fortunes and misfortunes rooted in the complex West African and African history. The years 1973 – 1981 witnessed a rise in the oil price – Nigeria's main source of revenue – which enabled the state to make significant investments in public works and light industries. This pull-factor brought greater numbers of migrants from neighbouring countries into Nigeria, a process further propelled by the 1973 and 1974 drought in the Sahel region. An International Monetary Fund (IMF) Structural Adjustment Programme which imposed unpopular cuts in social expenditure followed in 1983, an election year in Nigeria. The confluence of negative socio-economic circumstances impacted on the political sphere, drawing into the potent mix, migrants who, until then, had not featured prominently in the Nigerian public discourse. A pattern emerges here: the greater the economic hardship, the louder the anti-immigrant decibels become. Nigerian academics Johnson Aremu and Adeyinka Ajayi would later note, in a paper published in 2014 that, "With Ghana's continued economic misfortunes, the Government and popular press really had no difficulty turning to aliens as scapegoats for their malaise. "The expulsion order may also be seen as an attempt by [Prime Minister] Kofi Busia to win the confidence of the masses and restore the legitimacy of his government. Since government was losing its grip on the economic survival of the country, Busia and his cabinet members were left with little or no choice than to seek solace in sending away non-nationals as a way of appeasing the anger of the masses." It entered the electoral terrain in dramatic fashion when, in November last year, City of Johannesburg Mayor Herman Mashaba, generated a little storm in a tea cup; 'arresting' a man for carrying a cow head destined for dismembering and eventual sale in the informal market. Endorsing his boss' 'arrest,' David Tembe, the chief of the Johannesburg Metropolitan Police Department (JMPD) claimed that the man was an undocumented migrant. Mashaba boldly claimed that his intervention was a preventative measure against the Ebola disease, suggesting that Africans from beyond our borders are nothing but mobile carriers of disease! But the entire spectacle was suspect. It bore the hallmarks of the launch of a choreographed anti-African immigrant electoral platform by Mashaba's party, the Democratic Alliance (DA). For while Mashaba was shopping for publicity and applause by targeting a lone informal trader in the streets of Johannesburg and making emotive and offensive statements about other Africans, DA Member of Parliament Jacques Julius was simultaneously engaged in his own lengthy Twitter campaign along the South African and Mozambican border, demanding that the government "Secure[s] Our Borders". In fact, to be fair to the DA, the most virulent charge against migrants was led by Safety and Security Deputy Minister Bongani Mkongi at a press conference in July 14, 2017. To illustrate the gravity of his stance, it is best to quote him in full: "The question arises and we must investigate also what the law of South Africa is saying, how can a city in South Africa be 80% foreign nationals. That is dangerous. That in Hillbrow and the surrounding areas, South Africans have surrendered their own city. The nation should discuss that particular question.